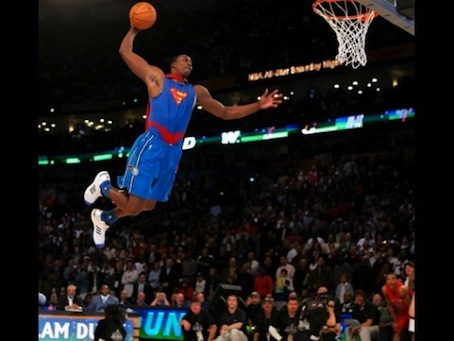 In the midst of All Star Weekend, while some writers, bloggers and fans argue about their team’s chances of winning it all, a majority of fans and bloggers speculate on the landing spot for the current Superman, Dwight Howard. While many teams clamor for Howard’s services, the Los Angeles Lakers, Dallas Mavericks, and New Jersey Nets have risen to the top as options for the superstar. However, even teams such as the Hawks, Warriors and Clippers have been connected to Howard. While superstars have yielded their power in these instances in the past couple of years, Howard has been more reluctant to embrace this position; straddling the fence as he speaks to the media. Howard regularly vacillates on whether he wants to stay or leave. Many have called out Howard for being “scared” to be the bad guy, which is the role many assume he would be cast for leaving the Orlando Magic. The league is at a stand still until someone pulls the trigger. Other teams have been reluctant to make deals; feeling that a Dwight Howard deal can set off a domino effect around the league. While each team has an offer for the star, Howard himself holds the cards. Whatever team trades for Howard will have to make certain that the star will sign a long term deal with the franchise. Guessing a destination for Howard is almost impossible, but Howard should focus on the chemistry and role he needs to play in order to be a champion. Stars like Dwyane Wade, Amare Stoudemire and others can attest to the importance of having defined roles when having multiple stars on a team. Anthony and Stoudemire still have not figured it out yet in New York, and it seemed to take a full season to learn to balance James, Wade and Chris Bosh in the offense. Howard’s role as a superior defender and rebounder have clearly been established. More than likely he’ll have to go to a team where scoring 20 to 30 points a game is not what a Center is needed to do. However Howard has stated he wants to play in a larger market that will allow him to find more cross marketing opportunities. Note to Mr. Howard: You won’t be young forever. Eventually fans, writers, and coaches are going to start expecting you to come out of the playoffs with some type of hardware. Preferably a ring of some sort. Find someone to play your “Kobe” role. I love this writers articles. He really knows his sports.